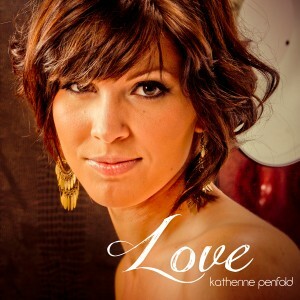 Valentine’s Day is around the corner, and Katherine Penfold is bringing the Love! The North Vancouver-based singer/songwriter has been singing for more than a decade, all the while establishing an expressive, genuine style. Originally from Nova Scotia, she started singing Celtic and Folk music at age 13, later branching into Funk and R&B, then Jazz and Adult Contemporary. 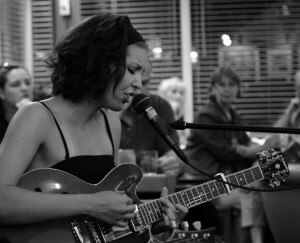 She also made her way across Canada – leaving the east coast to spend some time on the coffeehouse circuit in Manitoba and Saskatchewan, and is now based in North Vancouver. Her new album, Love, was two years in the making. She began recording in Winnipeg, then completed the vocal tracks in Australia. The album was released down under in September, 2012 while she was living in Melbourne. It’s a relaxing, soulful album that was originally [going to be] acoustic; a stripped back sound. But as the songs got written the project got bigger – something that really envelopes the listener with all the strings and percussion involved, and even some horns– while still allowing me to truly sing the way I like to: raw, natural, and unchanged. This album represents every aspect of my life; departing what was before, progressing to what is and what will be in the future – it’s been an unbelievable journey to this point. Is the album a natural progression for you, or more of a departure? It took over two years to create this album. It needed a much different perspective from that of my first release, Journals, and that perspective wasn’t in me to give right away. One of the biggest life-lessons I’ve learned in the past few years is that one always has to keep growing, even when you don’t know how to. I’ve been incredibly fortunate that mentors keep presenting themselves in my life, guiding me along. My whole life has been a bit of a rough progression, but the last two years most of all. I wouldn’t change any moment of it, and that’s why I see Love as a departure as well. This album represents every aspect of my life; departing what was before, progressing to what is and what will be in the future – it’s been an unbelievable journey to this point… I’m so excited for what’s next. One of the most random, un-planned processes I know – for this album I had a few of the songs come to me before the time-crunch began, but my producer is very good at prodding me to get writing. At one point, I drove to a really secluded cabin and stayed there, writing every day. I had a few days of tearing my hair out, but then everything began to flow. I never know when I’m going to write a song, but when they come along it’s like a cold: you feel a sneeze, then a sore throat…. I hear a melody in the afternoon then it goes away, then at dinner a whole verse will come into my head with that melody. By the time I’m lying down for bed the chorus suddenly chimes into my head and the rest of the verses, and tah-dah! It’s all done. “It Was You” is a great song, what’s the story behind it? It was not my favourite song at the beginning! It was a tune that plagued me forever. When my producer, Jordan, and I began talking about recording this album, I sent him all the bits and pieces that could become a contender. I got this email back with a 10 second sound clip he’d cut out of ALL those recordings – what is now the first line of “It Was You” (the first line of the chorus.) It was a line I had heard and sung quickly; brushing it off… I didn’t think it was great, but he wanted a song out of that line. More than a year went by and I couldn’t figure out the rest, no matter how I tried. It took my producer “locking” me in the studio, saying I wasn’t allowed to leave until it was done – he knew it was going to be this “great” tune. I grumbled and muddled and finally got something figured out, and it’s turned into a tune we really love. The words, of course, are about my partner, Luke. He is the biggest supporter of any idea I have; I’m incredibly grateful that he’s in my life! What is your favourite music to sing? I love singing Jazz and Adult Contemporary, it’s what I naturally write. That music touches me, and recreating those old standards is always an awesome experience… but my secret love is singing Funk/R&B music; there’s nothing that gives me such a rush, such great feeling of joy. Something that really grooves and lets me do whatever I want with my voice. My favourite songs to listen to are from Joss Stone’s “Introducing Joss Stone.” She’s always been a huge idol of mine – that woman can SING. You’re a knitter! How long have you been knitting? I learned to knit when I was a little girl, but I about three years ago I collected a bunch of needles, books, wool, and suddenly I was knitting things for anyone I could find who needed something! I make a lot of fingerless gloves; there’s a surprisingly large amount of people who want them. Dog sweaters, scarves, iphone cases – I love any challenge! I love pottery, photography, textiles… basically, any visual art. I’ve just started making my own bread, too! I don’t get much chance to do my hobbies. I’m on the “job” from the moment I get up to when I go to bed. I’m determined to take my career as far as I can take it, and I know the commitment I need to do that. That’s not to say I don’t have entire days of no internet in my knitting chair. First there’s the Love – Album Sampler that I’m giving away for FREE until Valentine’s Day; four songs, plus a secret track, that anyone can download from my website – I want everyone to be able to have some of my music! There are quite a few shows around Canada coming up in the next few months, beginning with a trip to Winnipeg for a mini Valentine’s Day tour. Also, I’ll be going to Australia later in the year to tour and promote Love. We have some big plans for Australia. 2013 is going to be a big year – I’m really excited! Thank you, Katherine… for the interview and for sharing the Love! Be sure to visit Katherine’s web site before Valentine’s Day to download your FREE album sampler! She has more videos of her songs on YouTube – check them out! You can also connect with Katherine Penfold on Facebook and Twitter. Thank you, Kate! I love her music (no pun intended). I downloaded the free album sampler and I can’t wait for her Australia tour so I can see her in person. Yay! I know you’ll enjoy the songs. Hope you get to see her in person too!! What a beautiful post. Thanks to SITS Girls for sending me your way on this Sharefest Saturday. Exalted Peacock recently posted..Monday Motivation #6: Living Arms Wide Open: what does that mean and how do you achieve it?